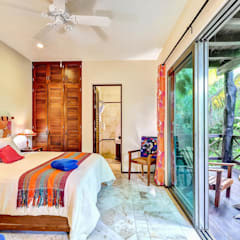 What does a typical tropical bedroom look like? 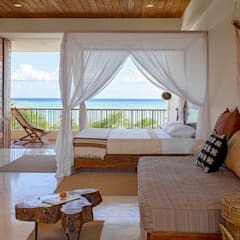 A tropical bedroom has many unique characteristics, especially in the type of furniture, and the way in which all the personal elements of a bedroom work together. Let’s start with the furniture, which is usually very rustic and does not match each other. Most of the furniture is oddly shaped and sized, but most importantly the furniture has more than one colour because it has a rustic style. For instance the accent tables are usually a natural wood colour that has been painted white and then to give it that rustic look, it is sanded down to reveal the wood underneath. Many of the elements that are in this style of room have Spanish and island colours such as coral red and turquoise that compliment the base colours alongside them. Something else to look out for that will be in a standard tropical room would be the bright lighting that is usually from natural lighting. 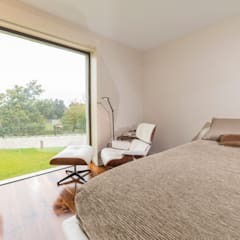 The natural lighting can come through the stunning oversized windows that should be one of the most common features in a tropical style bedroom. 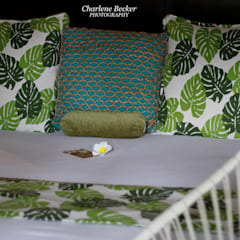 Which colours will best suit a tropical bedroom? 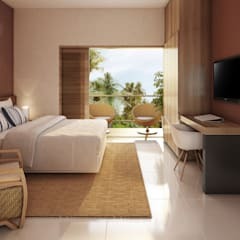 The first colour that can be used in a tropical style bedroom is brown. This colour can be used and found in the natural wooden elements like on the floors and in the furniture. 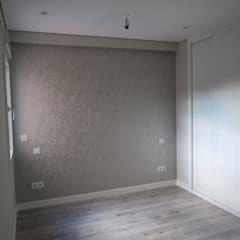 The deeper brown colours should be used in the room, in elements such as the curtains, some of the furniture, and even in the decorative pieces. The second colour that will work perfectly is turquoise. This is preferably suited for the walls of the bedroom, but can also be used in the decorations like in the bedside lamps, or in the curtains that dress the windows. 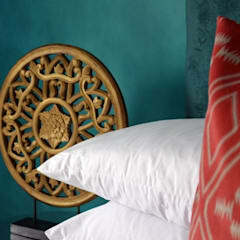 Another way to add turquoise is in the bed linen and the pillows that should be scattered on the bed and on the furniture around the room. The nest colour that suggested to use in the tropical setting is green. There is not specific green that is needed, but tropical designs are often paired with vibrant greens that can be used in many ways. One way is by installing an indoor garden. These are not as complicated as they sound, they are simply a small square that is reserved in the middle or the corner of the house that can be filled with a small water fountain, a medium size tree and three or four smaller plants. 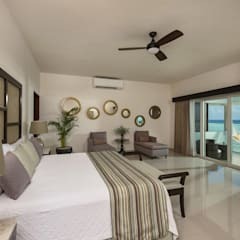 What kind of decorative elements can I add to my tropical bedroom? 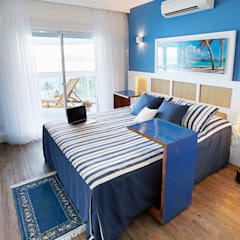 Decorating a tropical style bedroom will probably be one of the more fun projects as there are many kinds of eclectic colours and pieces that you could add to the bedroom. 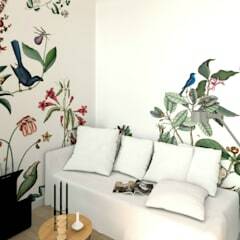 The first piece that is highly recommended for a tropical bedroom is a fun and vibrant wallpaper. The bolder and the large the pattern the better. 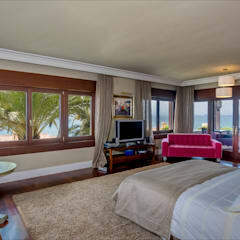 The wallpaper should preferably contain colours such as green and yellow, to help add some texture to the room. The second for of decoration could be a base colour accent table. 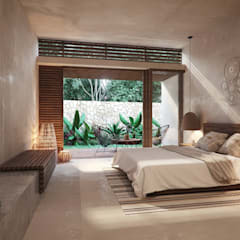 A base colour in a tropical bedroom could be white or brown. 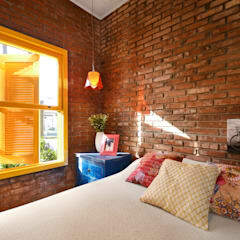 This is a simple way to try and balance out the room that now has many bright and bold colours flowing throughout it. 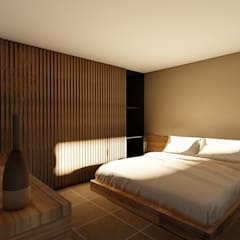 The tables should be up to the shoulder length of the height of the bed. This is a standard way to measure if the tables need to altered or even to consider new accent tables. Finally, as interior designers and decorators would, we can consider the most popular decorative elements in any style bedroom, plants. These can be completely based on the colour scheme, the size of the room as well as the species of plant that is prefered for the homeowner. There are many options such as a miniature palm tree, or generally any plant with large or round shaped leaves. 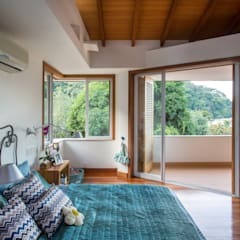 How should the doors and floors be done in a tropical bedroom? 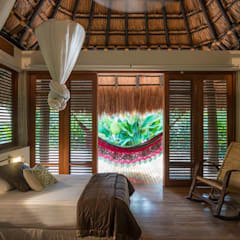 Starting with the doors in a tropical style bedroom, there are many options to consider. 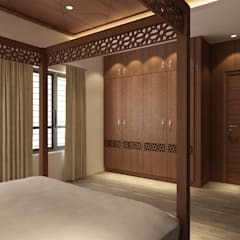 Starting with a more traditional look, classic wooden doors can be considered for the interior of a tropical bedroom. The specific kind of wooden doors to be used are not exactly specific but more of being made of wood generally. They can be plain smooth wood, or have detailed pattern carvings on them. 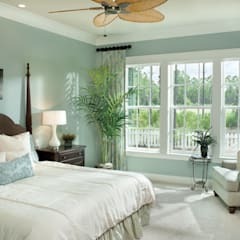 The floors in a tropical style bedroom have fewer options to consider but all are still great choices for floors. The first to consider would be hardwood flooring. A beautiful dark hardwood floor is compatible with any style of design as well as with the tropical style. What is great about these floors is that they can be left bare, or they can have carpets placed on top of them. One thing to be cautious about is that they scratch easily, and must be swept and polished often to keep that stunning shine.